The article primarily provides an overview of the regulatory aspects of setting up/ incorporating a business in India by Foreign Nationals/ NRIs in light of the changed regulatory environment in the past few years. It aims to cover areas related to Foreign Direct Investment (FDI) policy and RBI Circulars, Companies Act, 2013 for Indian as well as Foreign Companies. At the outset please note that the term ‘Indian’ or ‘Foreign’ companies do not necessarily denote ownership. It merely denotes the place of registration. Thus when a foreign national incorporate a company in India, it is indeed an Indian Company. But when a foreign company decided to set up only a branch office in India, it is termed as a Foreign Company. We shall see more of that later on. It is to be noted that the capital to be invested by the Foreign National/ NRI shall be classified as ‘Foreign Direct Investment’ (FDI) in India. Before the economic liberalisation in India in the 1990s, there were a high number of restrictions for FDI in India. Gradually, the restrictions have been watered down to a great extent and currently, the restrictions are in place for only those business activities that are strategic to the interests of the country or are politically sensitive issues such as Retails trade, Defence, Telecom, Real Estate etc. A business where prior permission is required from the Government (concerned ministry). This is also called as Approval Route. A business where no prior permission is required. Please note that in all case, once the FDI is received and accepted by the Recipient Company, an intimation is to be sent to the Reserve Bank of India(RBI) in Form FC-GPRS within a month of allotting the shares to the foreign shareholder. Thus the first place for any foreign national or any Non-Resident to look out for is the FDI policy. They have to first understand if there are any restrictions, prohibitions in the proposed business activity and then move forward to the company formation process. Now let us talk in detail about the approval process. This is being used very less with a great amount of liberalization nowadays. But if the proposed FDI does not fall within the automatic route, then prior permission has to be taken from the RBI and the concerned ministry before the investment is brought in India. Please note that the Foreign Investment and Promotion Board (FIPB) is no longer in existence. This is most suitable for companies who neither have nor see much of a presence in India. Liaison offices are extremely restricted in what they can do and are mainly set up as a communication medium between the Foreign company and its existing customers in India. A Liaison office can’t solicit customers nor indulge in any form of promotion. They can’t carry out business operations in India. At the cost of repetition, their role is to merely act as a communication medium between the Foreign Company and the existing Indian customers. Because of its limited role, the compliance to be completed by a Liaison Office are the least. The biggest advantage is in income taxes where the provisions of Permanent Establishment and Transfer Pricing may not be much of a concern since the Liaison office does not earn any income as such. This is the next step towards a full fledged branch business presence in India. A branch office in India can execute most of the tasks that a Limited Company can execute except manufacturing. A Branch Office acts as a branch of the foreign company, be its permanent establishment under the tax laws and can earn income from business operations. Recently the RBI has tightened the norms regarding who can open a branch office in India. One of the criteria is that the Foreign Company intending to open a branch office in India should have a track record of at least 5 years of profit making. A Project office is like a temporary branch office set up for a particular project. A Limited Company/ Private Limited Company means having a full-fledged presence in India. Unlike the previous three entities which are technically called as Foreign Companies, a subsidiary company is called an Indian company. The compliances are also greater than a foreign company. With the liberalization in FDI norms and also the automatic route being applicable for most LLP, hence the LLP route is now being considered to be one of the most preferred routes for Foreign Direct Investment (FDI). It does away with the compulsory presence of the directors/ shareholders or proxy directors. However at least one partner (even though he or she can be merely nominee partner) should be resident Indian. The absence of many requirements like rigorous rules for deposits, for maintenance of various registers and books of accounts for audits, for meeting of management and shareholders etc. coupled with absence of dividend distribution taxes mean that LLP, in most cases, should become the most favoured entity for Foreign Individuals and Multi-national Corporations in the future while investing in India. The first thing to note is that FDI will be allowed only in those LLPs where 100% FDI is allowed through the automatic route and there are no FDI-linked performance related conditions. No FDI shall be allowed in agricultural/plantation activity, print media or real estate business. Now let us talk in detail about the procedure to set up a branch, liaison or project office in India. The first step is to approach the Reserve Bank (RBI) of India for permission to do so. The documents that are generally required are Parent Company’s Annual Report for last three years, Certificate of registration, License, Power of Attorney attested by the Indian embassy in the home country, Board Resolution, the reason for setting up an office in India etc. If the RBI is satisfied with the above documents, then it gives a letter of approval. Kindly note that the approval letter from RBI may contain some conditions and which are to be observed in the strictest sense. The permission may be for a particular time period, generally three years. Once the permission from the RBI is obtained, then the permission is required from the Registrar of Companies in a single form along with payment of the requisite fees. The entity is known with the extension of the particular office. For example, the branch office in India of ‘ XYZ Inc.’ would be known as XYZ Inc. India Branch Office. One important thing to be noted is the appointment of an Authorised Signatory in India. He shall be responsible for all the compliances of the Foreign Company in India. 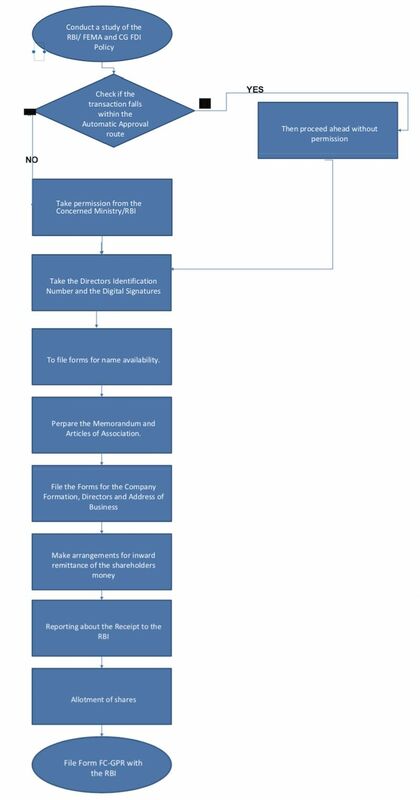 Procedure to set up a limited company in India is given by the following flowchart. The procedure is quite similar to that of a private limited or limited Company. First, we have to check if the same falls under automatic route, then the incorporation process starts immediately else the required approvals need to be taken from the RBI/ concerned Ministry. The name approval and incorporation process are slightly easier as compared to a private limited/ limited company since it is, at the moment, decentralised across individual Registrar of Companies. It does take some more time to incorporate but the slight delay is worth it. After the incorporation, the subscribers need to sign an LLP Deed with adequate stamp duty. The LLP deed combines the role which the Articles and Memorandum of Association have for the Company structure. "How Foreign Nationals / NRI's can setup a Business in India [Overview]", 5 out of 5 based on 1 ratings. The author is a practicing Chartered Accountant based at Mumbai. Please contact him at [email protected]cabks.in or visit www.cabks.in in case of any further queries. 5 Ways to beat Petrol price hike! India’s Growing Middle Class Impacts Foreign Investment Strategies! I have a question. If a resident who have a sole proprietor business and a current account is planning to move abroad. Can he still keep his current account and firm or we have to close the account? Hi. Thanks for the informative article. What are the procedures and policies that we need to be aware about. Kindly let us know ASAP. I would like to know whether an NRI can form a sole proprietorship firm for export purpose. I am a US citizen moved to India and want to start coconut business in my village in AP along with my cousin who is an NRI. We both were planning to register a partnership firm to start the business in India.From what i read above partnership firm is not allowed.Is this true? if so, Can we add an Indian citizen as a third partner to register as partnership firm? if this works, what is the share percentage that Indian citizen should contain to maintain the firm? Appreciate your response. As far as I know, there are no restrictions on a foreign national signing the lease agreement if he has been duly authorised by the Board vide a Resolution of the Board of Directors. I am a foreign national and I’m looking to start a restaurant in India, can I be a sole proprietor of the restaurant? Since you are a foreign national, any investment that you make in India is classified as Foreign Direct Investment (FDI). FDI norms are very clear that foreign nationals cannot invest in proprietorships and partnerships. Sir, you cannot start multi brand retail trade in India., That is not allowed as per FDI norms. Pl provide procedure to form a Pvt Ltd company not as a sister company to foreign Company. Hello all, a friend of mine (Foreign national ) is planning to set up a engineering service company in india can any one suggest the process to set up a partnership firm, besides what can be the stack ownership to him. FDI is not allowed for foreign nationals in partnership firm. He is advised to go for a private limited Company. I am NRI and I am a shareholder in a private limited company. I have become the shareholder where I applied as a resident indian, not an NRI. I am an ordinary shareholder and not a director or officeer in the company. Is there any problem for me in the long term? Or should I change to NRI status? In short it is a very good information for FDI. In Automatic rout there is no permission is required but it has also sectoral cap and period required for repatriation of their income gain from India therefore it need to know policies about sectoral cap. If it is also describe then it will help more. A foreign Company has opened a branch Office in India. Now the Foreign Company wants itself to be converted in a Proprietorship Firm. What would be the repercussions on the Branch Office in India of such conversion. very informative article and well organised. My son is a NRI and a software Engineer in USA. He as an s individual wants to employ software professionals in India for development of the whole or part of the softwares which he would sell in USA. Can he open a Sole Properietorship Current A/c in India for making payments to his employees, office Rent, & other Expenses related to making of Software. what would be the implications of taxes here in India in this situation. Can a PIO join a partnership firm (become partner) along with Indian National in India? Foreign Direct Investment is not permitted in a sole proprietorship (individual capacity) for foreign nationals. can a foreign national do consultancy in India in its individual capacitywithout going thru the company formation route and whether there is any restriction in doing consultancy in sectors of the economy. FC-GPR is required for any FDI whether it is investment by subscription to the memorandum or an investment in an already existing company. If the Foreign natonals are the only subscriber’ to the MOA and the first director’s of the company then also we need to do the FC-GPR process? Since they are the only shareholders having an Indian Company with Indian address. I understand FC-GPR is to be filed when there is a investment in the existing company by the foreign antional/ NRI. very well organised research done. Thanks for the post. Facility management can be a good helping hand for NRIs to setup new business in India. The finance ministry has this week also approved a proposal to allow 51% FDI in multi-brand retail – that could bring giants like Walmart and Tesco to India. Nice article , thanks for this post . This is simple to understand.I will forward this article to my NRI friends who wants to set up business in India.If the NRI friends read this then most of my time will be saved.Thanks for writing this article. DEv, the document which you have referenced seems to be a document published in 2003. I suspect that most of the FDI sectors have seen considerable changes in it. I found the exact policy at ( http://dipp.nic.in/manual/manual_0403.pdf ), which might be helpful for readers. Its a bit difficult. The FDI policy has so many sector classifications. Any generalisation would be a bit risky. However sectors like IT, wholesale trading, business consultancy services, manufacturing except for specific exceptions are sectors where no prior permission is required. However post intimation notification must go. Nice article .. would help if you can publish a list of the sectors in which full FDI investment is allowed. a very well done job Bhavesh! I will bookmark this page for future reference!